…it’s so much more than those small, white grains sticking to your spoon. 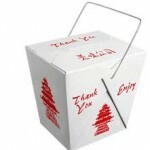 It’s much more than the contents of the white take-out container that accompanies your moo goo gai pan. 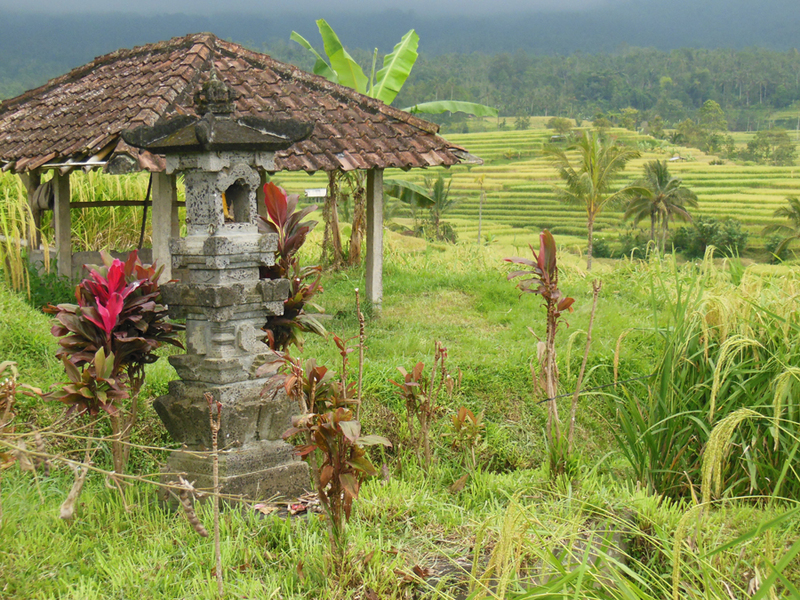 To understand rice and its significance, particularly in Bali, is to get an exclusive glimpse into the world of the Balinese people. For many, their lives and their religion are centered around the life of rice – the planting, growing and harvesting of the very staple that nourishes them. And every phase is celebrated with a ceremony. 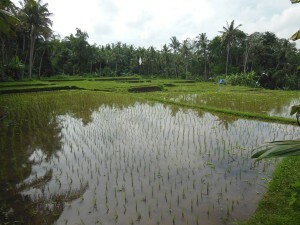 It has been utterly fascinating to me to learn about the whole rice-growing process. 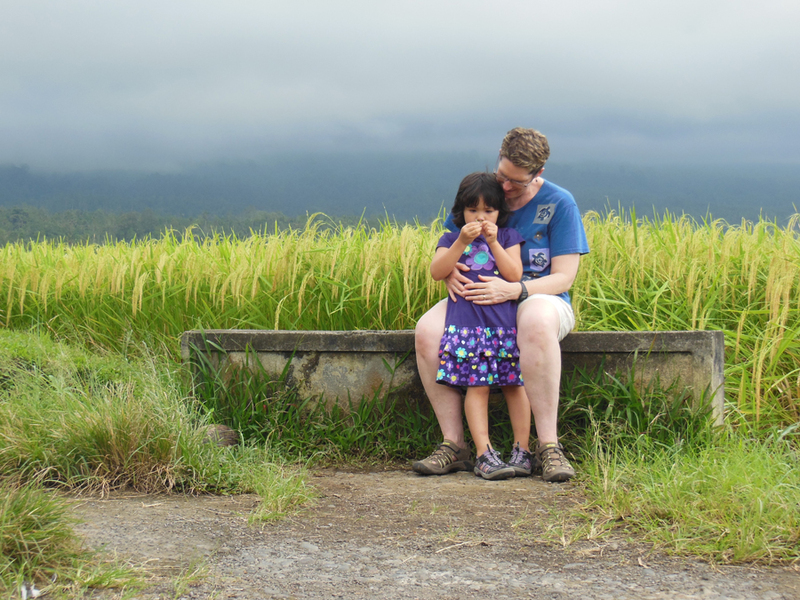 We discover our passions in the strangest of places, and for me, I think I was a rice farmer in another life. 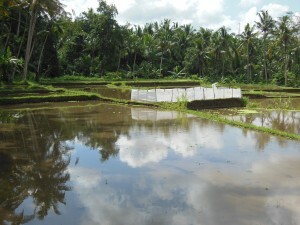 We are very lucky to have witnessed some of the different stages of the rice cycle, right in front of our villa. When we got here, they were still preparing the fields for planting, which entails flooding the fields and plowing and leveling the mud. Many farmers still use water buffalo for plowing. 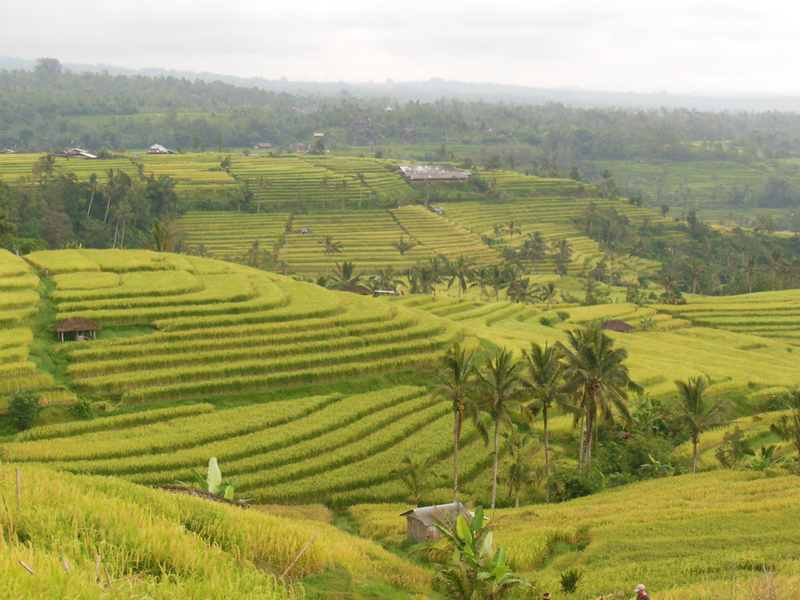 The irrigation system is planned in accordance to the schedule of planting, as water flows from the top of the terraced fields to the bottom in a very deliberate way. While they are preparing the fields, they mark off one section to plant seeds that will grow into seedlings. Ten days after we arrived at Tatiapi, the seedlings were ready to be transplanted, and we watched them plant the seedlings, one-by-one, by hand, into the prepared fields. To watch the farmers plant is like watching someone put a blade of grass into the dirt, one at a time, until acres are covered – but like, in hypersonic speed! Once the fields are planted, we, the spectators, sit back and watch the fields transform into different shades of green (while the farmers continue to manage and maintain the fields). 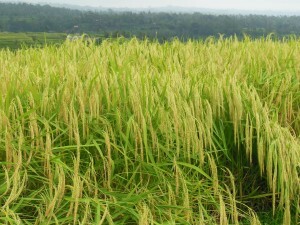 At harvest time, the mature rice is threshed right in the fields, and the rice grains are laid out to dry. After the fields have time to rest, they are flooded and the cycle starts all over again! All of this done by hand. In the hot sun. 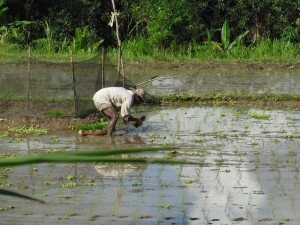 So, the next time you take a fork-full of that fluffy, white stuff…give a small nod of gratitude to those rice farmers. It has been so great reading about your adventures. I’m so sorry you’ve had such awful health problems and very sorry for the loss of your friend Michael. Reading is my drug of choice when I have problems. I find it restorative. It can be like meditation. I find I am almost out of my body, unaware of my problems both physical and mental. When I start I am very reluctant to stop. See what I mean about “drug of choice”. The rhythm of your words and the word pictures that you build are very transporting. I look forward to reading more of your blog for that restoration. Be well Kai, Megan and Carla. That means so much to me, Gayle. Thank you so much! exquisite beauty and appreciation for every grain of rice!